Climate sensitivity is defined as the temperature response to a doubling of carbon dioxide in the atmosphere. The problem of sensitivity – low or high – is central to the arguments on climate. There is, however, a third possibility – abrupt climate change. It is an idea identified by the US Academy of Sciences as long ago as 2002 as the new climate consensus. The diagram below shows the results of a so called one dimensional (1-D) climate model. The model uses simple climate equations that interact and behave in complex ways. The model has two stable states with two points of abrupt climate change – the latter at the transitions from the blue lines to the red from above and below. The two axes are normalized solar energy inputs μ (insolation) to the climate system and a global mean temperature. The current day energy input is μ = 1 with a global mean temperature of 287.7 degrees Kelvin. This is a relatively balmy 58.2 degrees Fahrenheit. It is very close to the transition point Tc – warming may well be preferable to even modest cooling. The 1-D climate model uses physically based equations to determine changes in the climate system as a result of changes in solar intensity, ice reflectance and greenhouse gases. With a small decrease in radiation from the Sun – or an increase in ice cover – the system becomes unstable with runaway ice feedbacks. This is seen in the real climate. Runaway ice feedbacks drive the transitions between glacial states and warm interludes that have occurred repeatedly over the past 2.58 million years. There are warm interludes – such as the present time – of relatively short duration and longer duration cold states. The transition between climate states is characterised by a series of step changes between comfortable warm conditions and mile thick glaciers in North America. Abrupt change is evidence of an internal dynamical mechanism in the climate system. The plot originates from work for Ghil’s Ph.D. thesis in 1975 and was reproduced in a 2013 World Scientific Review article to illustrate a dynamic definition of climate sensitivity in a climate system that exhibits abrupt change. The simple model shows a transition to ‘Snowball Earth’ conditions that have occurred in the very distant past. We may well hope that the chance of such a catastrophic transition is remote. It did cause a bit of consternation in the 1970’s when it was realized that a very small decrease in solar intensity – or an increase in albedo – is sufficient to cause a rapid transition to an icy planet. Ghil’s model shows that climate sensitivity (γ) is variable. It is the change in temperature (ΔT) divided by the change in the control variable (Δμ) – the tangent at a point to the curve shown above. 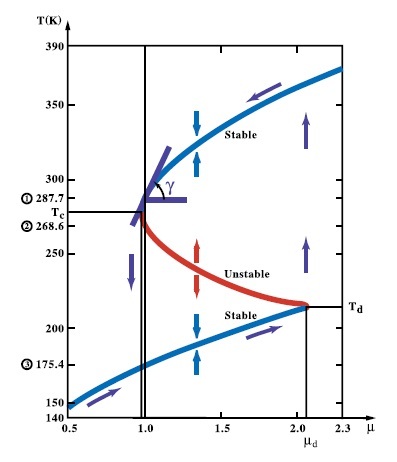 Sensitivity increases moving down the upper curve to the left towards the bifurcation and becomes arbitrarily large at the instability. The problem in a chaotic climate then becomes not one of quantifying climate sensitivity in a smoothly evolving climate but of predicting the onset of abrupt climate shifts and their implications for climate and society. The other problem with low or high climate sensitivity is that it leads nowhere useful. It is not an argument that can be technically decisive – the data, the methods and the theories are unable to provide definitive answers. Moreover – even if winning the science high ground in the climate battle was possible – it would not win the broader culture war. It would seem to be more important to affirm the centrality of economic growth and making progress on environmental conservation. Economic growth provides resources for solving both human and environmental problems.